Note: This is the seventh article in an eight-part series on Realty Income. Previous articles have covered Realty Income's history, business model, industry, income statement/balance sheet, management, and growth opportunities. Realty Income Corporation (NYSE:O) is widely considered to be one of the highest-quality REITs in the market, consistently producing market-beating returns and a growing income stream for its shareholders. However, just like every other stock in the market, Realty Income has its risks. Here's what you need to know before considering an investment in Realty Income -- or any similar REIT. REIT investing involves its own set of risks, but each risk affects different companies in different ways. Here are five major REIT risks and a look at how they could potentially affect Realty Income. One risk that can quickly erode a REIT's profits is a falling occupancy rate, resulting in properties that sit vacant. This may seem like a serious threat to Realty Income, especially considering its high exposure to retailers. Service-oriented -- Businesses that have little threat from online competition, such as fitness centers and movie theaters. Non-discretionary -- Businesses that sell items consumers need and that also have little risk of losing sales to online retailers. Examples include drug stores and grocery stores. Low price point -- Businesses that specialize in low-priced goods, such as dollar stores, wholesale clubs, and fast-food restaurants. These businesses tend to perform well during tough economic times. Furthermore, Realty Income's tenants are on long-term leases with annual rent increases built in. The company's average tenant has 10.3 years remaining on their lease, and only a small percentage of the portfolio's leases expire each year, meaning few tenants can choose to vacate during tough times. Of course, there is still some risk here. For example, one or more of Realty Income's major tenants could conceivably go bankrupt. However, because of the factors I've discussed here, Realty Income has maintained excellent occupancy throughout its history. Currently, the company's properties are 98.2% occupied, and that percentage has never dropped below 96%, no matter what the economy or real estate market is doing. Perhaps the most obvious risk to a REIT investor is falling property values. After all, if a REIT owns properties worth $3 billion today, and their value falls to $2 billion next year, its shares would (theoretically) lose about one-third of their value. This is certainly a risk worth noting, and it's entirely possible for the value of Realty Income's properties to fall. However, keep in mind that commercial property values work somewhat differently from the residential home values that most people are most familiar with. Commercial properties primarily derive their value from their ability to generate income, and because of the long-term leases I discussed earlier, this is one of Realty Income's strong points. Even if the economy crashes again, if a certain property has a 15-year lease with an investment-grade tenant, its ability to generate income -- and therefore its property value -- remains strong. During tough times, Realty Income (and its share price) does suffer, but not as much as you may think. The financial crisis of 2008-2009 saw the worst real-estate crash in recent history, and Realty Income, although its share price fell, beat the S&P 500 by a wide margin. REITs tend to perform poorly during periods of rising interest rates for a couple of reasons. For starters, higher interest rates cause the REIT's cost of borrowing money to increase, so the spread between its cost of capital and its rental income can narrow significantly. This tends to have the biggest effect on REITs that rely heavily on borrowed money, and Realty Income's debt is relatively low at 32.8% of its overall capitalization. However, the fact remains that Realty Income will likely suffer from some spread compression as interest rates rise. The second reason interest rates can have an adverse effect on REITs is that higher rates make lower-risk investments like bonds and CDs more appealing. In other words, right now, Realty Income's 5% yield looks like an excellent choice for income seekers when the average five-year CD yield is a paltry 0.87% and the 10-year Treasury pays 2.18%. However, if interest rates rise to the point where investors can get a 4% yield from a risk-free CD, income investors may be tempted to sell their "riskier" investments like REITs, weakening demand for REIT shares and pushing prices down. REITs generally concentrate on a single type of property, such as apartment buildings, medical facilities, or, in Realty Income's case, retail properties. This lack of diversification can leave the REIT vulnerable to economic conditions specific to that type of property. In our case, weakness in the retail sector could hurt Realty Income. However, this risk isn't quite as bad as it seems. I've already mentioned that Realty Income specializes in property types that tend to do well in bad economic climates and that have little competition from online rivals. Further, Realty Income's revenue stream is more diversified than it appears. Even though Realty Income is definitely retail-dependent (nearly 80% of the portfolio is retail), it doesn't depend too heavily on any single type of retail. The portfolio is made up of companies representing 47 distinct retail industries, and none make up more than 10.7% of the portfolio. It leases its properties to 235 tenants altogether, about half of which have investment-grade credit ratings. Realty Income is geographically diverse as well, with properties in 49 states and Puerto Rico. The point is that Realty Income is about as diversified as a REIT that specializes in retail can be, though the risk of a depressed retail environment is still worth considering before you invest. Virtually all REITs use debt to some degree in order to expand their holdings and boost returns. This creates a risk, especially during tough economic times, as debt needs to be repaid even when revenue falls. In Realty Income's case, debt is far from the biggest risk. As I mentioned, Realty Income's debt is quite low as a percentage of its total capitalization, and the company brings in more than enough money to cover its payments. In fact, Realty Income's debt coverage ratio is four-to-one, which means that for every dollar in interest payments, the company earns $4. So, while debt is a risk for all REITs, it would take a serious plunge in revenue for Realty Income to have trouble covering its debt. 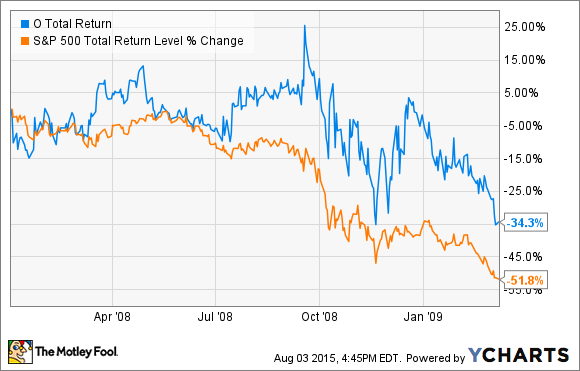 Realty Income has risks to consider, just like any other stock. However, in this case, I feel that the reward potential greatly outweighs the risk. After all, Realty Income has paid out 540 consecutive monthly dividends and has increased its payout for the past 71 quarters, no matter what the economy was doing. This consistent performance has handsomely rewarded shareholders: The stock has produced an average annual total return of 16.4% since going public in 1994. While Realty Income has its risks, its consistent, market-beating performance in good times and bad suggests to me that the company does an excellent job of managing them.